Tanaka was born in Taiwan in 1918. He learned about a shortage of medical doctors in Okinawa in 1975 and got involved in improving communal medical care in Okinawa. He serves as the director of the Akamichi Clinic in Akamichi in Uruma City and sees his patients regularly to this day. In addition to the Ginowan Rotary Club, Taiwanese rotary club members and patients also attended the event and handed him flowers and gifts. 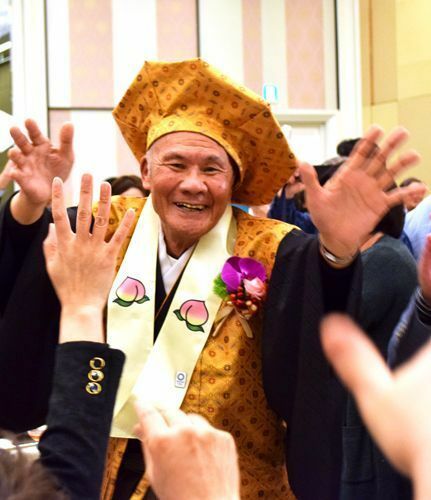 All the participants then danced the traditional “kachaashi” to congratulate Dr. Tanaka on his long and healthy life.